On 22 November a special meeting took place in Melle (BE). 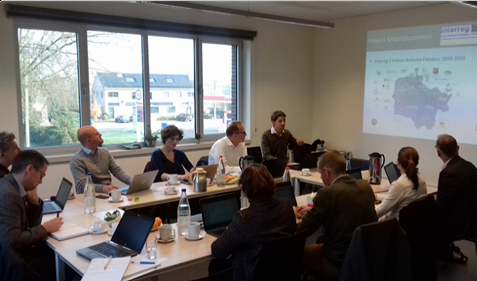 Participants from five project who deal with residual agricultural streams gathered to share knowledge and information and to discuss how they could cooperate. The projects are co-funded by four different Interreg programmes. 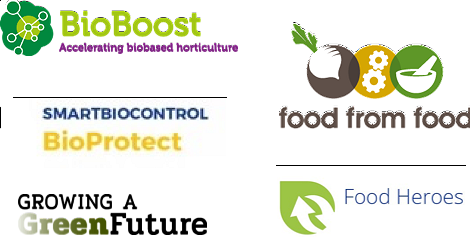 Apart from BioBoost (2 Zeeënprogramma) this concerns the following projects: Food from food (Vlaanderen-Nederland), Food Heroes (Noordwest Europa), SmartBiocontrol/BioProtect (France-Wallonie-Vlaanderen) and Growing a Green Future (Vlaanderen-Nederland). See for more information their websites. It was concluded that cooperation is possible on content, but that it is also interesting to find out how the projects can cooperate in communication and dissemination of results. Also useful could be sharing of experiences and insights regarding stimulating the usage of agricultural residual streams for new purposes. The projects plan to come together one more time to further discuss this. This can provide valuable input for the strategy BioBoost will develop to promote utilisation of horticultural ‘waste’ streams for new purposes.